See more objects with the tag horses, graphic design, advertising, information, clothing, sales, commercial poster, consumers, denim, jeans, American West, history, cowboys. See more objects with the color darkslategrey steelblue darkslategrey rosybrown steelblue or see all the colors for this object. This is a Poster. It was made for (as the client) Levi Strauss. It is dated ca. 1975–80 and we acquired it in 1981. Its medium is offset lithograph on paper. It is a part of the Drawings, Prints, and Graphic Design department. 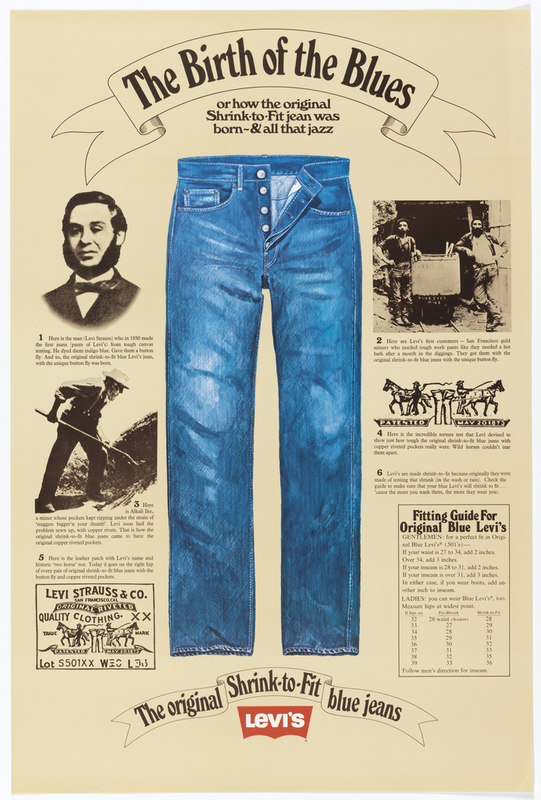 This poster depicts scenes from Levi Strauss & Co.'s history. In 1870, Jacob Davis, a Nevada-based tent and wagon cover maker, used denim from San Francisco–based dry goods wholesaler Levi Strauss, shown top left, to make pants for a local woodcutter. 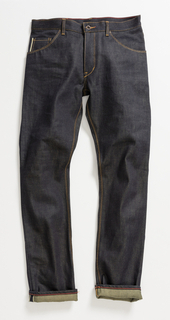 Davis had the innovative idea to reinforce stress points near pockets with copper rivets, creating sturdier pants. Strauss agreed to finance the idea, and the two received a patent for "Improvement in Fastening Pocket-Openings" in 1873. 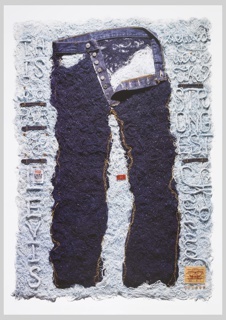 Though the pants were originally of brown canvas, that year, when Levi’s original waist-high overalls were created, is considered "the birth of the blues.” In 1886, Strauss applied the two-horse logo to the jeans’ right hip; two images of this logo, showing two work horses unable to pull apart the jeans, are depicted middle right and lower left. Strauss marketed the sturdy new pants to gold miners, shown middle left and top right. On the lower right is a shrink-to-fit guide; the pants shrink in wash or rain, and buyers had to plan for such changes. Levi’s, proud of its history, used its unique story as part of its branding mission when it expanded internationally in the 1970s, when this poster was made. This object was featured in our Object of the Day series in a post titled Levi's Design Stands the Test of Time.